International shipping counts for more than 2 percent of global carbon dioxide emissions, roughly the same as aircraft. 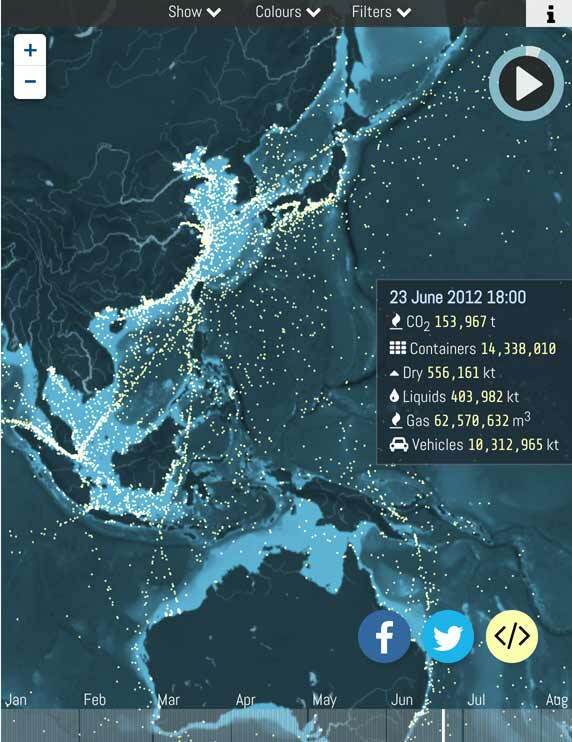 Scroll down in that article to the animated depiction (header image above, from millions of geo-data points) of container ship movements, plus the cargos they are carrying on any given day. Scroll around the globe, zoom in, and ponder. For sure, you received an Amazon delivery that was carried on one of those moving dots. Be sure and click the PLAY button to hear an informative narrative about the present and future of getting our STUFF from China and other non-local sources. Some of you Floyd folk viewed the movie called Freightened: The Real Price of Shipping. For many of us, it was shocking and sobering. I know it made me realize in a more informed way when I passed a tractor-trailer hauling a MAERSK container somewhere on I-81—where it had come from and what it represented. The globalization of commerce rides on pallets stacked in containers and containers stacked ten-high and thirty long by industrial robots in a shipping yard in Norfolk or Shanghai. You can see the entire documentary Freightened (if you don’t mind the distracting page-wrap) on YouTube at the link. The fact that the International Maritime Organization is actually making progress on the industry’s energy-and-resource footprint is encouraging. Imagine some day our children may see giant sails moving their widgets silently into port.